A friend recently expressed his confusion about the outrage over the death of Ali Dawabsheh, the 18-month-old Palestinian toddler who was killed last month when Jewish settlers firebombed his home in the occupied West Bank. (The child’s father was also badly burned in the attack, and eight days later died from his injuries.) An attack that kills a sleeping toddler is surely horrific. But Israeli violence against Palestinian children is an aspect of the Palestine conflict almost as central as the perpetuation of historical lies through the force of repetition. What is it then, in the Israeli and Western public arena, that makes the assault on Palestinian life sometimes seem outrageous, and at other times acceptable? 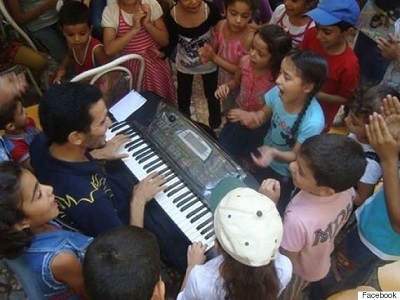 Of the approximately 1.9 million Palestinians living in the Gaza Strip, nearly half are eighteen years old or younger. Nearly forty-three per cent are fourteen years old or younger. Not that the targeting of adults is less than horrific! But the siege on Gaza, in its entirety, is part of a war on Palestinian life. It was in February 2008, several months after the ongoing siege of Gaza was imposed, that Israel’s deputy defence minister threatened the Palestinians of Gaza with a ‘Shoah’ – the Hebrew word usually reserved exclusively to refer to the Nazi holocaust. Public relations aside, Israeli policy has incrementally moved in this direction. Several weeks after Vilnai made his threat, 50,000 infant vaccines were spoiled in Gaza as even the general storage unit of Gaza’s health ministry was starved of fuel. At year’s end came Operation Cast Lead. T-shirts circulated among Israeli soldiers featuring a veiled, pregnant woman, her belly targeted in the crosshairs of a rifle, alongside the slogan ‘One Shot, Two Kills’. So it was, and so it has remained; last summer, more than five hundred Palestinian children were among the more than two thousand Palestinians in Gaza killed by Israel’s armed forces. Educated Western liberals wince at these facts. Like they winced when Israel’s current justice minister, Ayelet Shaked, posted an article referring to Palestinian children as ‘little snakes’. But they also know that Palestinian life can be a form of antisemitism. Israel, after all, demands a Jewish majority in any territory it rules with representative institutions. It also wants the land where Palestinians live. The dilemma is clear. It was not prime minister Netanyahu, that friend of Republicans, but prime minister Golda Meir, that object of liberal admiration, who once expressed her fear that she ‘would have to wake up every morning wondering how many Arab babies have been born during the night’. If too many Palestinians live in Palestine, the Jewish majority is threatened; and with it, we are told, the Jewish right to self-determination. This, explain Israel’s finest liberals, is antisemitism. In other words, Palestinian existence itself verges on antisemitism. Likewise, anyone who does not understand Israel’s historic need to expel Palestinians, or its current need to force them into densely populated enclaves in which they are stripped of political rights, is something of a racist. The polling strength of the New Democratic Party (NDP) gives the party new prominence on this issue, as generally. 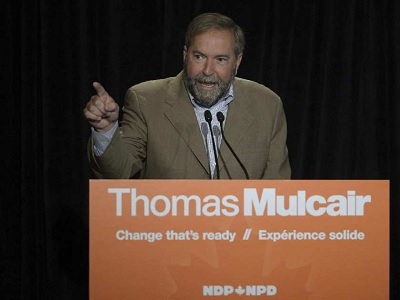 It was recently revealed that the party’s leader, Tom Mulcair, is on record praising Margaret Thatcher. Coming from the leader of Canadian federalism’s presumed social-democratic alternative, this raises troubling questions. Meanwhile, at least as concerns Palestine, Thatcher’s market-fundamentalist mantra goes some way towards describing the federal ballot choices on offer: There Is No Alternative. It was a Liberal government that began to step up Canada’s support for Israel against the Palestinians, in 2004-5. It was the Conservative government that pushed this shift even further. The Mulcair leadership of the NDP, while less extreme, is going out of its way to signal that it will not fundamentally challenge the status quo. This situation is best considered in context. What David Bush describes as ‘Canada’s bloody political consensus on Israel and Palestine’ has become extreme over the past several years. But the problem has deeper roots. Since Israel’s establishment, Canadian policy has gravitated towards the pro-Israel fringe of world politics. Throughout the Cold War, Canada not only stood with the West in supporting Israel against the entire Third World. It also tended to stand with a narrow cluster of US allies on the anti-Palestinian end of the Western political spectrum. In 1977 Donald Jamieson, external affairs minister for the Pierre Trudeau government, felt compelled to respond to those parliamentary critics who complained that on Palestine ‘we are at odds with our good friends the Japanese, or at odds with our good friends the Europeans and forget that we were not at odds with our best friend, the US.’ There is some real continuity between the Trudeau government’s posture, bluntly expressed by Jamieson, and Stephen Harper’s 2014 declaration, in a joint press conference with Netanyahu, that isolation in the face of world opinion is a ‘fundamental Canadian ethic’. Moreover, as a succession of Liberal and Tory governments presided over this Canadian diplomatic tradition, neither the NDP nor its predecessor, the Cooperative Commonwealth Federation (CCF), offered reliable opposition. In 1975, for example, at a time when Israel was firmly established as a pillar of US empire and an enemy of popular movements across the world, no less a Canadian social-democratic luminary than Tommy Douglas declared that Israel was ‘like a light set upon a hill – the light of democracy in a night of darkness’. At the time, through the ‘night of darkness’, governments and popular movements across the Third World were united in supporting Palestinian rights and condemning Israel’s anachronistic colonialism. On no issue apart from South African apartheid was there comparable Third World unanimity. When in 2013 Harper declared that Israel is a ‘light of freedom and democracy in what is otherwise a region of darkness’, he was praising Israel-as-Western-outpost against the societies indigenous to the Middle East. It was, in effect, an expression of regressive colonial politics. But these are not exclusive to Tory history. Across the West, in fact, support for Israel was historically stronger on the left than the right of the governing political spectrum. Democrats in the US, the Labour Party in Britain, and the Socialist Party in France were for decades all more strongly associated with Israel than were their conservative counterparts. Likewise in Canada. It is generally agreed that there was more disagreement on Middle East policy within than between the main Canadian political parties. But all in all, as Irving Abella notes in the same 1989 interview that I cite above, ‘the New Democratic Party has been the most supportive of the Israeli cause, largely because of its close relationship to Israel’s Labour party, and to the Histadrut, the Israeli trade union movement’. For a time in the late 1980s, the Liberals seemed the party most contemptuous of Palestinian rights. Since the 2000s, this position has definitively fallen to the Tories. Still, the NDP’s pro-Israel history is not so distant a historical artifact. The predominance of the NDP’s pro-Israel faction lasted well into the 1980s. Under Reagan and Likud, it became all too obvious that to consistently support Israel was to be on the wrong side of most major world conflicts of the day. Israel was globally allied with forces of the far right. Pressure built up in 1982, when Israeli forces under Ariel Sharon’s command devastated Lebanon, killing thousands of Palestinians and Lebanese. At the end of the year, Sharon visited Honduras, highlighting Israeli support for the US-backed contra war against Nicaragua. Sharon’s host, General Gustavo Álvarez Martínez, had proclaimed his admiration for two of history’s great military men: Irwin Rommel and Ariel Sharon. The 1982 massacres of Palestinians and Lebanese could not be ignored. Israel’s military support of the Latin American far right, meanwhile, like its alliance with apartheid South Africa, could not be brushed aside with anti-Arab racism or the standard lies surrounding the Palestine question. Reviewing its policy in 1983, the NDP issued some words of criticism. It condemned ‘the collaboration of Israel with one of the world’s most racist regimes’ (South Africa) and raised questions about ‘recent reports of Israeli military advisers in Honduras, and the visit of Defence Minister Sharon there.’ Nonetheless, despite gradual movement on the Palestine question, the party’s fundamental support for Israel remained unshaken. NDP stalwarts like Canadian Labour Congress (CLC) president Dennis McDermott remained regressive advocates for Israel through to the end of the Cold War and beyond. By the time open Israeli warfare against the Palestinians intensified anew in the 2000s, the NDP tended to be more critical of Israel than the other federalist parties. Israeli propaganda had become harder for social democrats to swallow, as Israel’s Labour Party hypocrisy was pushed to the margins by the more forthright colonialism of the Israeli right. One should not write out of history the efforts of those in the NDP who distinguished themselves, by Canadian standards, in their criticism of Israel’s perpetual war on the Palestinians. There were years in which they pushed the NDP towards some decent human rights advocacy. But their position in the party should not be exaggerated, either in its prominence or its durability. Of the main federalist parties, the NDP can credibly cast itself as the lesser evil. As the least bad of the electoral options, it has also drawn into its ranks principled people looking to bring some progressive politics into the narrow spectacle of Canadian electoral politics. There are surely those on the periphery of the party looking to draw things in as decent a direction as the structures allow. The Mulcair leadership, however, is doing its very best to emphasize that it is not out to transform Canadian politics. Rather, it is vying for the managerial task of presiding over a slightly tweaked version of the economic and foreign policy status quo. As concerns Palestine in particular, it has not simply marginalized those suggesting that the NDP might present an alternative approach; it has clamped down on them. ‘In the first weeks of the election campaign,’ as Justin Podur details in a recent article, ‘two NDP politicians have had to distance themselves from statements about facts that are utterly obvious to anyone who knows Israel/Palestine, one nominated candidate has had to resign, and many more NDP members have been blocked by the party from seeking nominations to run for office.’ Those writing to the party to criticize the purge have received a form response explaining that factual criticism of Israel is ‘contrary to NDP policy, which opposes terrorism’. Set aside the fact that in this calculus, Palestinians rank nowhere near that classic US standard, ‘three-fifths of a human being’. Given the balance between Israeli and Palestinian civilian deaths tolls, a focus on Palestinian as against Israeli terrorism only adds up if a Palestinian life is worth less than one-hundredth of an Israeli. Set aside the NDP’s failure to seriously challenge the Harper Tories for their brazen celebration of Israeli efforts to destroy Palestinian society. In the final count, Mulcair’s fidelity to a complicit federal consensus should be condemned. But it is not terribly surprising. The NDP is not riding the crest of a wave of social movements. The difficulty for movements to hold elected social-democratic leaders accountable in the best of circumstances is painfully familiar. In a system as rotten as Canada’s, and as tightly structured around established social hierarchies, even a leader campaigning to the left could hardly be expected to stay there once elected in the absence of massive social pressure from below. Mulcair is barely going through the motions. He is presenting himself as a prospective manager of the status quo, not its adversary. A significant change in Canadian policy on Palestine will never come without more of a fight. It will take a change in the balance of forces, not a change in management. In twenty-first century Canada, it is easy for many to ask whether the position that Palestinians are human beings is one of those many notions that are just too radical for Canadian respectability. Differences of degree can matter, and attention to contradictions and openings can help guide strategic action. At the same time, weighing these differences without losing one’s humanity requires some balance. The problem is suggested by Sadri Khiari’s commentary on the all-too-reasonable expectations of white liberalism in France. Khiari writes: ‘It reminds me, from the time of slavery, of those white abolitionists who considered that the balance of forces – between whites – didn’t yet allow for more demands than the right for slaves to wear shoes or a shirt. In 1799, in England, the left of the epoch won a great victory: from then on, according to the terms of the new law, in the hold of the ships that transported them to America, the African deportees had to have an average space of 0.7 square metres and no longer 0.46 square metres. It was certain that this was progress since the right, if it knew about the process, would for its part surely have proposed that they be vacuum-packed . . .’. How to most strategically relate to the contradictory pulls on the NDP is an open challenge. But the outrageous record of this Tory government is symptomatic of Canadian political realities that extend well beyond it. One way or the other, the long fight ahead should not be approached with any illusions. – Dan Freeman-Maloy is a Montreal-based activist and writer. He contributed this article to PalestineChronicle.com. Visit his website: notesonhypocrisy.com. Michele K. Esposito, ‘Quarterly Update on Conflict and Diplomacy, 16 February – 15 May 2008’, Journal of Palestine Studies (vol. 47, no. 4), p. 124. Nira Yuval-Davis, ‘The Jewish Collectivity’, in Khamsin Collective, ed., Women in the Middle East (London: Zed Books, 1987), p. 61. This argument has perhaps been best elaborated by Amnon Rubinstein and Alexander Yakobson. I review their polemics from pages 21-25 of this booklet. In David Taras and David Goldberg, eds., The Domestic Battleground: Canada and the Arab-Israeli Conflict (Montreal and Kingston: McGill-Queen’s University Press, 1989), p. 244. Canada News Briefs by the Associated Press (7 March 2002). ‘The Prime Minister’s Speech: “There is no justification for acts of terror”’, National Post (7 March 2002). Paul Noble, ‘Where angels fear to tread’, in Tareq Ismael, ed., Canada and the Arab World (Edmonton: University of Alberta Press, 1985), p. 135. Shira Herzog Bessin and David Kaufman, eds., Canada-Israel Friendship: The First Thirty Years (Toronto: Canada-Israel Committee, 1979), p. 140. Taras and Goldberg, The Domestic Battleground, p. 236. Benjamin Beit-Hallahmi, The Israeli Connection: Whom Israel Arms and Why (New York: Pantheon Books, 1987), p. 89. Ronnie Miller, From Lebanon to the Intifada: The Jewish Lobby and Canadian Middle East Policy (New York: University Press of America, 1991), p. 21. Sadri Khiari, La contre-révolution coloniale en France: De de Gaulle à Sarkozy (Paris: La Fabrique éditions, 2009), p. 12. Good comments. All Canadian political parties support Israel (Tories, Liberals, NDP, Greens) and Canadian foreign policy is well presented in the mainstream media. It follows the usual format – for the NDP a touch of verbal sympathy for the Palestinians, a stronger note supporting Israel’s ‘right’ to defend itself. For the Tories, it is outright Islamophobia, with Palestinians inclusively being terrorists. The current election does not touch upon foreign policy, a topic that is generally ignored by the Canadian public at large until something dramatic happens such as the attacks on Gaza, or with that other new evil, the Russophobia from current affairs in Ukraine. Canadians need to connect the Palestinian struggle to the First Nations’ fight for de-colonisation and national rights. The Canadian and Israeli government label any grassroots opposition as a threat to security and as a form of terrorism. See the Canadian bill C-51. Will the NDP be any better than the Conservatives or Liberals? Marginally so, I expect.